The Brown team relied on the testimonies and research of social scientists during throughout their legal strategy. Robert Carter, in particular, spearheaded this effort and worked to enlist the support of sociologists and psychologists who would be willing to provide expert social science testimony that dovetailed with the conclusions of “the doll tests.” Dr. Kenneth Clark provided testimony in the Briggs, Davis, and Delaware cases and co-authored a summary of the social science testimony delivered during the trials that was endorsed by 35 leading social scientists. 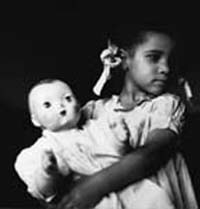 Although Dr. Kenneth Clark is most famous for the “Doll Tests,” his personal achievements are equally as prestigious. He was the first African American to earn a PhD in psychology at Columbia; to hold a permanent professorship at the City College of New York; to join the New York State Board of Regents; and to serve as president of the American Psychological Association. His wife Mamie Clark was the first African-American woman and the second African-American, after Kenneth Clark, to receive a doctorate in psychology at Columbia. 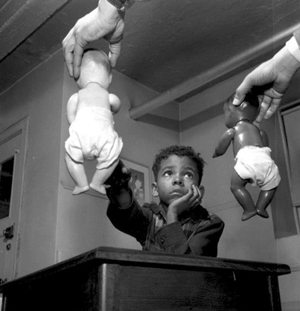 In 1946, the Clarks founded the Northside Center for Child Development in Harlem, where they conducted experiments on racial biases in education. During the 50’s and 60’s, the Clarks focused on New York City schools. 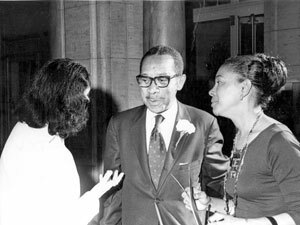 Dr. Kenneth Clark was a noted authority on integration, and in particular, he and his wife were closely involved in the integration efforts of New York City and New York State. 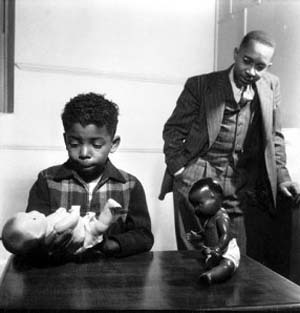 Dr. Kenneth Clark said of Harlem that “children not only feel inferior but are inferior in academic achievement.” He headed a Board of Education commission to ensure that the city’s schools would be integrated and to advocate for smaller classes, a more rigorous curriculum, and better facilities for the poorest schools. The Clarks also created Harlem Youth Opportunities Unlimited, or Haryou, in 1962 which was endorsed by then Attorney General Robert F. Kennedy and President Lyndon B. Johnson, whose administration earmarked $110 million to finance the program. Haryou recruited educational experts to better structure Harlem schools, provide resources and personnel for preschool programs and after-school remedial education, and reduce unemployment among blacks who had dropped out of school.